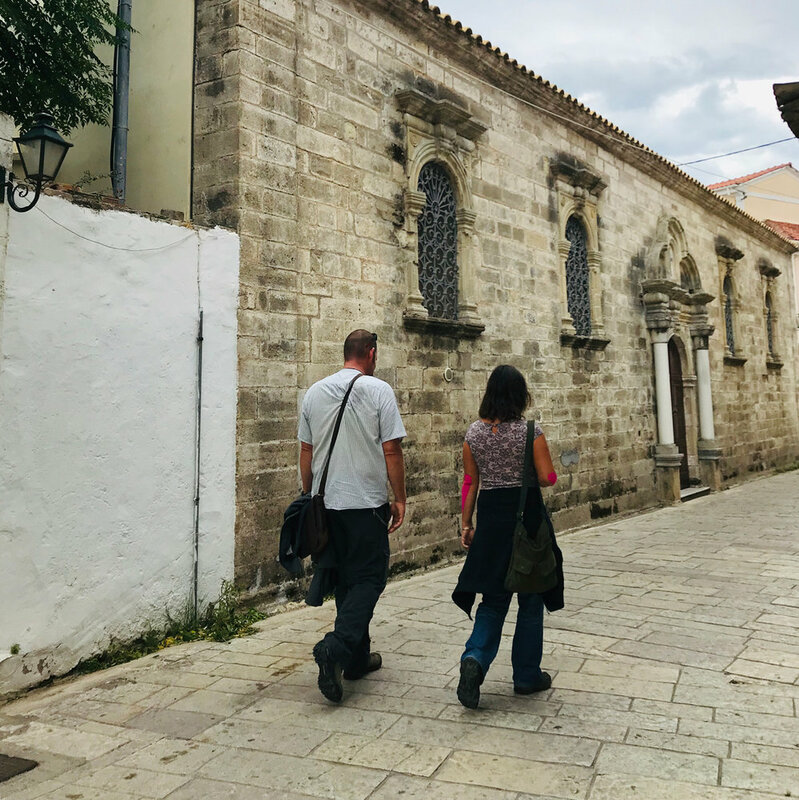 Prologue (from the Greek, prologos, meaning “before words”: This post spans the three days I used to get from my turquoise kitchen couch, to a Greek Isle town beside a (currently stormy) turquoise sea. I’m sitting on the couch in my kitchen, it’s a teal-y turquoisey color. I imagine the Ionian Sea will be some color close to this. In a few days, I’ll know for sure. I’ve been packing for a week. An entire SwimVacation will pop out of 6 bags. Swim buoys, SwimVacation banner, plug converters, clothes pins, swim caps, cameras cameras cameras, a bed splitter, a digital projector and on and on and on….don’t unzip these coolers before we get there or it will all spill out. For our crew - SwimVacation family Richie & Lisa (also known as Princess Lulu), the adventure has already been going for days. They left their new farmland in Portugal, had one car break down, missed the first ferry, drove as far as Spain, in the middle of which their second car broke down, missing the second ferry, finding new flights to England where they are now. They rented a car, drove up to their UK homes to pick up a few things, will drive back down to pick me up at Heathrow tomorrow evening. I’m tired just thinking about it and as I said, I’m still on the couch. Right. So, I made it off the couch. 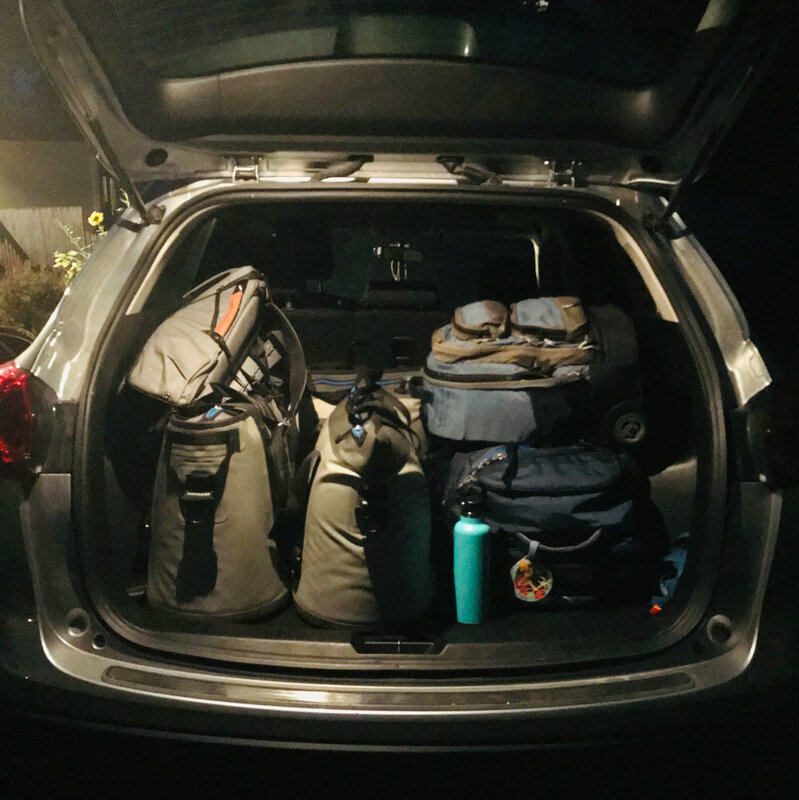 I loaded all of that stuff we think of as “A trip in 6 bags”, said my teary goodbyes and hopped in my car to head to Boston. Dropped two coolers of stuff with Simon, my trusty fellow guide this week. He’s flying directly to Athens on Saturday, and will accompany some of our guests on an overland journey to Lefkada, our starting point, in time for boarding the yacht on Sunday. I’m taking a slightly more circuitous route - flying to London for the night where I will be met by Richie and Lisa. And while my trip so far (I write to you now from an airplane somewhere over the Atlantic) hasn’t had the bumps theirs has, I did have an adventure of my own last night, foiled by bluetooth and google maps, a torrential rain storm just as I got to those pesky Revere traffic circles (it’s ok, you can go around again if you need to), then parking and trying to get twice my weight in 4 bags from my car to my hotel room. In the rain. I ended up in a room with a broken door, bruised myself shutting it, then actually couldn’t get it back open. I had to call for a rescue and a room change. Me and all those bags. I collapsed into bed about 11. I wanted to cry. I think I did. I was so mad at myself. I forgot that when traveling, it’s best to make things easy. Whenever possible, don’t over think it, and make it easy on yourself, kid. For example, when I was ready for my 5am departure for the airport this morning, I called the front desk and had them come get the bags. I said a lot of pleases and thank yous and readily tipped my way to the terminal. That’s right, take some deep breaths and don’t break into a sweat. Like open water swimming, travel is a marathon, not a sprint. So today, I pace myself. To be fair, some of the anxiety I feel is reasonable. I am, after all, about to lead 6 people on what I hope will be a spectacular week of swimming in a place I’ve never been. And while I have lots of experience at this, I also don’t take it lightly. Hopper and I carefully craft each SwimVacation experience. We do our homework and surround ourself with incredible partners - guides, crew, people on the ground at home and on location. Behind the scenes and on the set, we’ve put love and care into every choice. At go time, run we through our scenarios, check lists, assess resources and leap. So yeah, I kind of ran at it a little up stream last night. But there’s nothing like the kindness of strangers, a 7 hour flight with a great movie (The Theory of Everything - watch it), a big bottle of water and a neck pillow to straighten me out. Pause. My British Airways flight attendant just brought me a cookie. Specifically, a chocolate covered digestive. Package of two, don’t mind if I do. Yes, please. Thank you. In general, the world takes care of you when you let it. Especially when you stop trying to define what you think that should look like and just go with what is. Surrender. Open your eyes (heart), ask for help, pace yourself. What a wonderful thing to remember as I head into a week of open water swimming. A new place, a new sea. Our Mediterranean SwimVacation dream come true. In a few hours I’ll be reunited with Captain Richie and Chef Princess Lulu and we’ll be on our way. Tomorrow we’ll fly to Lefkada and provision and prep our ocean home for the week. It looks like we might have a little rain, a little wind, a little bit of everything. It will be just what it is and we will jump into a new blue sea. I can’t wait (but I will). I made it to London where Richie and Lisa picked me up at Heathrow in their teeny tiny rental car. Shoving all of my big bags (trip in 6 bags, you know) and myself into the back seat smushed up against the window. Like the clown car at the circus. We laughed all the way to Gatwick Airport to drop the car, pirate a luggage cart (I’ll never tell), and hoofed the half mile in the dark with cars coming at me from the wrong side of the road to our hotel for the night. Richie and Lisa apparently have a pizza tradition the night before traveling abroad, so we ordered dominos, drank a little wine and ate dinner on bouncy beds at 11pm, giggling like children. The laughter promptly stopped when we realized the taxi was coming to collect us in a mere 4 hours. Pizza boxes shut, lights out, and in what seemed like 5 minutes the lights came back on and we left for the airport. A pleasant 3 hour flight brought us to the isles of the Ionian sea, a bit rough today with this so called “Medicane” skirting our periphery. A beautiful early (early!!) morning flight from London, over the Alps, into the Ionian Islands beneath a stormy sky. We had a crazy van ride into town, a desperate search for small bill euros, a walk around the adorable town of Lefkada in an impressive wind. We checked in on our yacht charter base, did a reccy of the marina. Jetlagged, we staggered into a Gyro place for lunch, yes, please and thank you - now Sas parakaloume and efcharisto - and the delicious feta, tomato, cucumber, only two olives (wah), tzaziki and fantastic pork (not a big meat eater, loved it anyway) with side of chips (fries) were gone. Zombies, we stalked home to our rental flat. All of Lefkada is bedded down for a siesta and I couldn’t be happier about it. I put on my jammies and everything. So here I sit, feet up, fresh from a 20 minute snooze, telling you that this little town is adorbs and a great place to start our adventure. Tomorrow will be busy for us - provisioning and checking into the boat, setting things up for our guests and a million other things on our list. I’m adding to that letting the wind have her say, in the hopes she’ll blow herself out before our trip starts. In the end, we’ll take what we are given and wash it down with baklava. This is SwimVacation, this is Greece, this is the Mediterranean and we are ready to dive in.